Does your grass look like this? 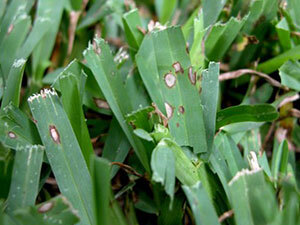 Gray leaf spot is a fungal disease that affects mostly St Augustine grass, but can also be found in Centipede, Bermuda and Ryegrass varieties. The fungus starts as small yellow/brown spots that soon elongate and grow to grayish tan ovals that are most prevalent when temperatures are between 77 and 86°F during the day and above 65°F at night, and is most severe during rainy, humid periods. Sound familiar? This disease, which causes blades of grass to wither and die if leaf spots are numerous, can be spread throughout your lawn via splashing rain drops, wind, or even just rolling your lawnmower across wet grass. If you're worried your lawn might be affected or want to set up regular maintenance to prevent diseases, contact Amazing Blades Landscaping today and let our lawn care services handle all the dirty work!